The Diocese of Cork and Ross includes Cork city, west Cork and most of mid Cork on the south side of the river Lee. The diocese also extends eastwards to Glounthaune and north-east to Watergrasshill. The Diocese is comprised of two previously separate dioceses. The Diocese of Ross is comprised of eleven parishes on the seaboard stretching from Timoleague, near Clonakilty, to Aughadown, west of Skibbereen. It includes parishes with beaches which are well known to holiday-makers from near and far. Places like Inchdoney, Baltimore and Owenahincha are all under the patronage of St. Fachtna. The diocese also includes several islands, including the gaeltacht of Oileán Cléire and Sherkin Island which has earned a name for study and research of its maritime environment. Ross diocese enjoyed complete independence between the twelfth century (when most diocesan boundaries were agreed) and 1693 when it was united with Cork and Cloyne. In 1849, it regained its own diocesan bishop until it was united with Cork diocese in 1958. Ross is predominantly a rural diocese and the rural community accounts for a sizable part of the Cork diocese, too. However, Cork city and its suburbs, the country’s second largest urban area (pop. 170,000 approx. 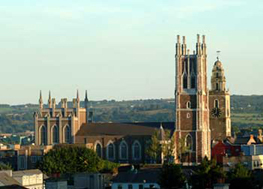 ), is home to the majority of the people of Cork diocese. Cork diocese has at different times been joined with Ross and Cloyne, including a period of 320 years from 1429 when it was joined with the latter. The border of the diocese is aligned with the valley of the river Lee which flows into the sea at Cork but rises near Gougane Barra, in the parish of Uibh Laoire. 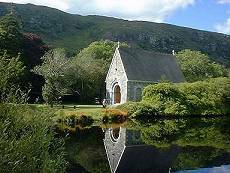 The heart of this popular pilgrimage and wedding site is the Oratory of St. Finbarr, patron of the Diocese of Cork, to whom tradition attributes the foundation of a monastic settlement in the marshlands of Cork from which the city later evolved. The Lee, famed in anthem and story, also provides an approximate guide to the line between Cloyne and Cork dioceses. The Cathedral of St. Mary and St. Anne, overlooks the city from the north side and is the diocesan see. A complete renovation of the historic Cathedral was initiated in 1994 by the late Bishop Michael Murphy. The work, including a reordering of the interior, was completed in 1996 at a cost of 3.25m euro. The Cathedral, which is known in the north side of the city as the North Chapel, has served the people for almost 200 years. The people of the Cathedral parish have been assisted by people from all parts of the dioceses and from far away in meeting the cost.The Cathedral is also where Bishop John Buckley began his ministry as bishop of the diocese on February 8th, 1998. Bishop Buckley is from Inchigeela and was auxiliary bishop since 1984. The Diocese of Cork and Ross is known for a strong spirit of mission. Cork city is home to the Presentation Sisters founded by Nano Nagle in the heart of the city at the beginning of the nineteenth century. Religious sisters and brothers of many congregations have moulded much of the life of the diocese and their contribution has been enormous, especially in health and education. People have also left from here to dot the globe with their own special imprint of Christianity. Missionary societies, religious orders and congregations are to be found at nearly every cross-roads in the city, and in the country, too, Their work is intertwined with the life and spirit of the people and the place. The local diocese also has a special connection with people in Peru and Ecuador in South America. The Diocese was spiritually twinned with 150,000 people in a shanty-town on the outskirts of the city of Trujillo in northern Peru in 1965. Priests and religious from Cork took pastoral responsibility for the area. Many of the priests of the diocese and Mercy and Bon Secours sisters have spent time working on the mission. A second mission was established on the edge of the city of Manta in Ecuador in 1993. The parishes have 80,000 people who were served by Cork and Ross priests until 2003. The work in both countries involved everything from providing health centres, to school classrooms, to catechetics programmes, to building churches, to helping people to work together for their own development. Modern day Cork and Ross with its pioneering pharmaceutical industries, computer plants, centres of learning, gourmet restaurants and advanced factories continues to provide a challenging place to live the Christian life. In the 2011 Census of Population, the population of the area was 334,824. Of these, 280,415 (83.74%) identified themselves as Catholic.